Roosevelt's secret war : FDR and World War II espionage · One Book. One Author. One Hour. Notes from front endpapers and front flyleaf: "FDR loved intrigue - Tehran trip - assassination attempt. - Where's Arlington Hall? - Los Alamos; Manhattan Project; Ultra; Magic. - FDR wanted unconditional surrender. - What impact on W.C. and Stalin? - OSS - how did it operate? How many people? Why was it shut out of Pacific? - President's secretary's file - FDR library. - Germans intercepted phone calls of W.C. and FDR. - Bob Loomis - got help from Colin Powell and staff; Margaret Suckley's file opened; by time he became Pres. dissimulation became 2nd nature. - Vincent Astor - spy activities, p. 9. - FDR liked private sources of intell. - William Friedman's team broke Jap. code in '36. - FDR knew of Germany, Japan, Italy partnership 6 months before State Dept., p. 13. - Who was in "The Room" then, The Club? - Tyler Kent - London embassy, 29 yr. old clerk with access to FDR-W.C. correspondence, p. 19; neutrality of FDR was questioned by Kent; W.C. wanted 50 ships; FDR had to decide about 3rd term; Joseph Kennedy - pants story - Amb. to Britain, p. 29; Kent gets 7 years. - Frank Knox (Rep.) to Navy Sec. / Henry Stimson, Sec. War. - Vincent Astor gets cooperation with British in New York - Sir James Paget, p. 50. - William Samuel Stephenson - Canadian head British Intell. in NYC; W.C. wanted him to draw US into the war. - John Franklin Carter told FDR in Albany he'd be Pres; wrote a column "We, the People"; created secret intell. - effort for FDR - also watched Astor. - Oshima, p. 239: 1943: over 400 messages [intercepted]; message 467. - Yamamoto shot from sky; Americans attack Japanese hospital ships, p. 244. - FDR's comment to William Bullitt, p. 252. - p. 295: Duncan Lee - Donovan's aide, Elizabeth Bentley - Soviet NKVD agents; 1944: Lee emotional wreck; Post Cold War Soviet documents show double digit number of agents in OSS. - FDR on Joe Stalin at Tehran Conf., 1943: "He won't try to annex anything", p. 273. - William Bullitt, 1948. - Geo. Earle - Turkey - told FDR of German threat to bomb east coast and NYC; threatened to expose Russian threat, p. 386. - p. 387: Story of Willie Colepaugh: CN boy - goes in US Navy - released for Nazi sympathies - gets berth on Swedish ocean liner, goes to Germany, becomes spy, dropped with others in Frenchman Bay; 20 cases of espionage since outbreak of war. - William J. Donovan - a Republican. - W.C. dragged feet on Overlord, p. 224; upset Americans wouldn't exchange info on Tube Alloys. - Because of FDR/W.C. agreement Klaus Fuchs got access to Los Alamos. - 1943: Army's Counter Intelligence Corps, p. 229: Supposed affair between ER and Joseph Lash; Marshall disbanded CIC after incorrect reports on ER. - ER and Hoover clashed - JEH investigated Tommy Thompson, ER's secretary; Hoover kept "undiluted trash" on ER/Lash relationship. - George Earle - Gov. of PA. - special envoy to Istanbul - spoke directly with FDR. - FDR declares "unconditional surrender". - 1944: W.C. hushed up fact that Americans killed 500 British POW in Italy because fact would expose that British were protecting Ultra, p. 289. - Turf battles between Donovan and Hoover." -- Notes from back endpapers: "Midway was a victory of intelligence, p. 189; turning point in Japan theater. - Chi[cago] Tribune - reports Stanley Johnson saw report while in Captain's cabin on cruiser New Orleans; wrote story saying U.S. knew Japanese moves ahead of time. - Hardly a record of a dependable conversation in FDR's whole life. - Sam Woods / Berlin embassy and early warning from FDR to Stalin about Hitler invasion 1942. - Frank Rowlett broke Purple in 18 months. - James R., Marine Captain, 1940, asked by his father to deliver secret message to World leader in the east - we'll help you fight the Nazis, p. 104. - Ultra: designation chosen for Enigma messages from Germans by the British at Bletchley Park. - Ch. 13: Alexander Sachs meeting with FDR about atomic bomb, Manhattan Project. - Pres. didn't like to commit anything to paper. - FDR was anti-imperialist - not Churchill, p. 412. - Morgenthau plan for after war with Germany, p. 334; it died. - Henry Wallace - 1944 - gave secrets to a Swiss friend, p. 344. - Gen. Marshall pleads with Dewey not to make Magic a campaign issue, p. 346. - Joseph K., Jr., killed - buzz bombs / Javaman / TV guided plant, p. 336. - Joe K. called FDR 'crippled SOB'." - Annotations by Brian Lamb in the margins and underlining of pertinent phrases throughout the book. 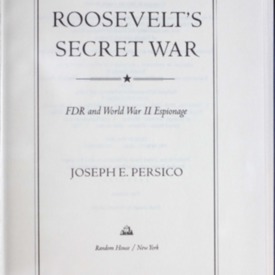 Persico, Joseph E, “Roosevelt's secret war : FDR and World War II espionage,” One Book. One Author. One Hour., accessed April 24, 2019, http://booknotes.gmu.edu/items/show/537. Despite all that has already been written on Franklin Delano Roosevelt, Joseph Persico has uncovered a hitherto overlooked dimension of FDR's wartime leadership: his involvement in intelligence and espionage operations. "Roosevelt's Secret War also describes how much FDR had been told - before the Holocaust - about the coming fate of Europe's Jews. And Persico also provides a definitive answer to the perennial question: Did FDR know in advance about the attack on Pearl Harbor?"--Jacket. "Roosevelt, Franklin D. (Franklin Delano), 1882-1945." "United States. Office of Strategic Services--History." "World War, 1939-1945--Secret service--United States."